The Port of Southampton tourist attractions. The Port of Southampton is a passenger and cargo port located in the central part of the south coast of England. 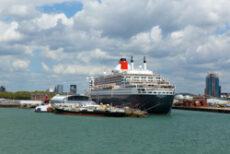 The modern era in the history of the Port of Southampton began when the first dock was inaugurated in 1843. The port has been owned and operated by Associated British Ports since 1982, and is the busiest cruise terminal and second largestcontainer port in the UK. Southampton Cruise terminals are about 128 km from Central London. London’s Heathrow Airport is the nearest London airport to Southampton, about 105 km distant. Southampton has a regional airport, the service to Paris may be of interest to a minority of travellers. There are four dedicated cruise terminals at Southampton which play host to a wide variety of cruise lines including AIDA, P&O Cruises, Princess, Cunard, Royal Caribbean, Celebrity, MSC Cruises, Carnival Cruise Line and Fred Olsen. Southampton is one of the most lively and dynamic cities in the south of England. From bustling shops and marinas to seaside resorts and areas of outstanding natural beauty, the city and region have lots to offer. Located on the south coast in the county of Hampshire, Southampton is a friendly and diverse city. The region enjoys the UK’s mildest climate. Whether you are visiting the city for the first time, on a return visit, on business with a few hours to spare, or you’re a resident wanting to find out more about the city, Southampton guarantees an enjoyable experience for everyone, of all ages and interests. Known as the cruise capital of Europe, Southampton plays host to over four million visitors a year and boasts an impressive cultural. It has an Old Town, with remnants of a castle to explore and the walls which surrounded it, a medieval merchant’s house, a 12th century city gate, a jaw-dropping Civic Centre, a 15th century Tudor House and much, much more. To top it all off, apart from its maritime heritage and sensational buildings, Southampton is also renowned for its many parks which run through the centre, leading to the new and hugely impressive Seacity Museum.